Dr.-Ing.h.c. 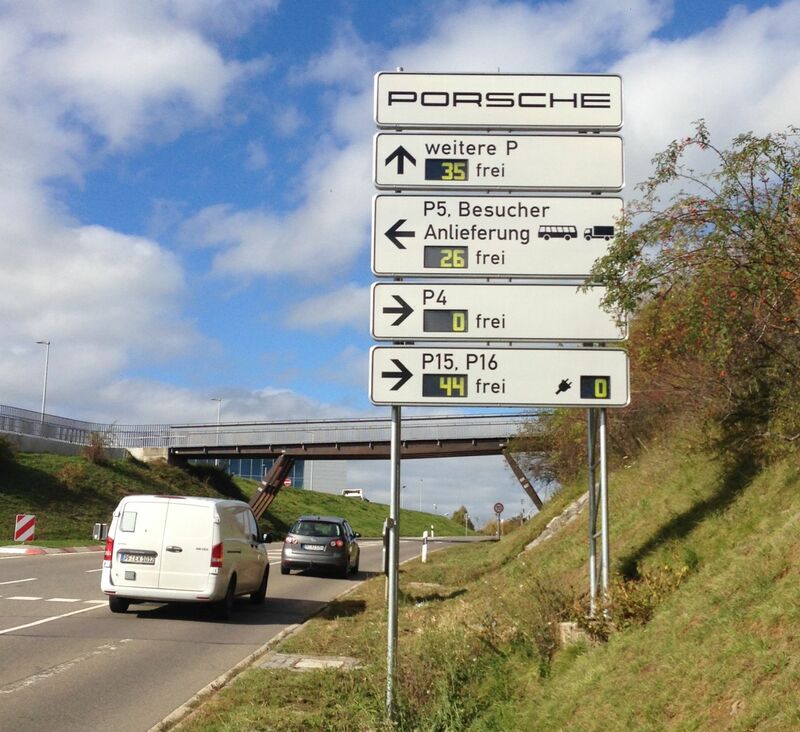 F. Porsche AG operates its development centre in Weissach, some 30 km west of Stuttgart, with approx. 6,500 employees. Particularly at the start of work, there is a lively search for parking spaces by employees in the company's own parking garages and parking lots. Timely information about the spots where parking spaces are still available reduces search traffic and stress in the morning. SWARCO in Germany reports the successful implementation of more than 20 parking guidance systems during 2017. New installations, the maintenance of existing systems with signage and computer upgrades and numerous extensions were the job of the experienced team based in Gaggenau near Karlsruhe. Sports car manufacturer Porsche AG is a prominent customer who ordered dynamic parking guidance systems for their development center in Weissach and the headquarters in Zuffenhausen. The expansion of the main factory also led to an increased need for parking spaces. In a first phase, new car parks were built and equipped near the entrances with eleven dynamic parking guidance signs informing about the current occupancy. Meanwhile a second construction phase has started, putting up signs in the city area of Stuttgart to inform the Porsche employees at an early stage which road to take to the next free parking house in Zuffenhausen. Often a parking guidance system is the first cornerstone for an integrated citywide traffic guidance and information system, as it has been installed by SWARCO in the Swiss town of Thun, considering particular traffic situations such as events, traffic incidents or construction works. C-ITS ready, modern parking guidance systems will be a great help for communities to tackle fine dust and emission impact.